Location : Beyond the reach of mortal kin. Outside of time's outstretched hand dwelling there within. The realm to which all planes seek to enter in. The tower had not been used in ages, most of the banners worn over time torn in places by wind and weather. Still they bore the colors of Tai'mira, a seemingly forgotten nation of elves and all others who sought freedom. It was not surprise to the ancient dragon that the tower once used as docking for a Tai'miran skyship lay gathering dust and nests of sea birds. At one time there would have been several of such Tai'miran vessels entering and leaving the port, carrying goods for trade and passengers. The other docking towers had long since been torn down, salvaged for building materials to be used elsewhere, except this particular tower. It had been exclusively used by the Highlord of Tai'mira, Locke Desmoste for his personal skyship. 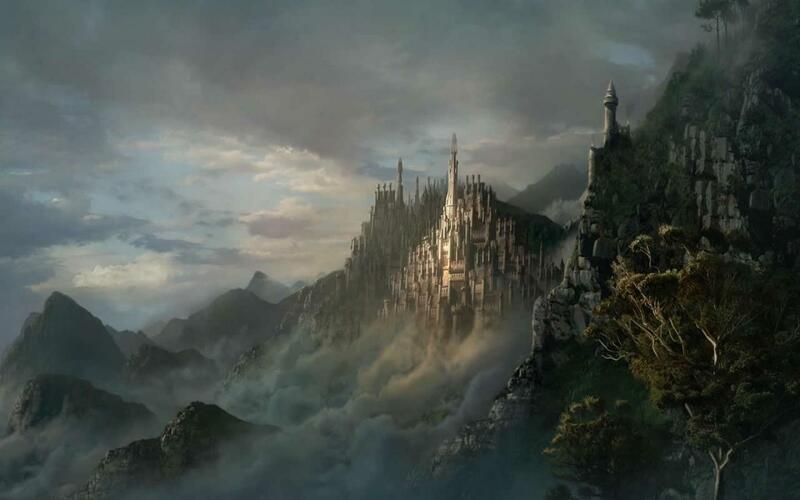 It had been somewhat surprising to Thasrissian that the tower was still standing after all the years that had gone by. Regardless it was still there perhaps a bit worn by time but there. Which brought a smile to his face as he stood atop the tower looking out over the horizon. It was time once more for a vessel of Tai'mira to grace the port with its presence. His skyship. "Our'thalis pan'daril eldara nalo. Gar'anil aura tallendon eldanil walara anvar yalan." Thasrissian chanted melodically in the voice of his elven form, his right hand open with the palm pointed out at sea. Somewhere out in the distance a rift could be seen opening much like in the past when a skyship was either arriving or departing. Only a few minutes later the Hyperion, the Tai'miran flagship exited the rift darting across the open space between where it had arrived and the tower slowing only when it was a good hundred feet away. Eventually it came to rest close enough to the tower for the boarding ramp to be lowered. Which with the flick of a wrist lowered at Thasrissian's command. Cirdan would know where to find him when it was nearly time for the wedding ceremony to be preformed, as no doubt word would be reaching him that a Tai'miran vessel had docked. The dragon had prepared the place he had mentioned earlier to Cirdan, with that one simple act of summoning his skyship to him. For now Thas would wait taking the time to find a nice sunny spot on the upper deck of his ship on which to stretch out in his dragon form and bathe in the sun. It had been a while since he had such a luxury and Thas was determined to make the most of it. She looked around the ship the snow melting she felt warmer and had stopped shivering since coming through the portal. Kip climbed out of her cleavage and went off to check out his stores. Thankfully the dragon was small and couldn't do too much damage or so she hoped. She walked along the rail looking down. She had been here before the memory was faint "I... I have been here before haven't I?" Trying to recall made her head throb, yet she was sure of it. She remembered bits here and there. She held her head and leaned on the rail without a word. The woman from before she almost didn't recognize her. Yet she was her or had been once when life was simpler. That life could never be reclaimed, no she had changed to much to pick up where she left off so for now she enjoyed the warm air and hummed a song that surfaced in her mind. It was a familiar one yet she couldn't place where it was from. Thas eased himself up off the deck moving over to Sharla. "Yes you have been here before. Quite a long time ago. Back when you were carried by the whim of whomever decided they would treat you badly. When I tried my best to prevent some of it. Of course I wasn't as adept at fighting those battles as I would have liked to have been at the time." The dragon slowly lowered his neck to rest against the railing. "Should be able to see the Palace from here." Thas said turning to look at Sharla for a moment. "Just a couple lengths out from the side of the ship is a barrier formed from a set of wards across the ship. Keeps people from falling too far off the ship. Though it also keeps the warmth you are feeling around the ship in as well. Not to mention the snow or rain out." Thas chuckled again then slid his head back away from the railing laying against the deck plating again. She smiled at him she didn't remember much of the times here there were flashes. A swamp with him and a cave and a feeling of dread. She looked down at the palace and smiled. "There is something... I don't know if it was real or in a dream but I could swear you and I were once close." She didn't say engaged or betrothed or the like but sat on the deck and braided her hair one one side. "Where have you been since here and what adventures have you had?" She asked and looked up at him eager to know. Wanting something to distract her from her own troubling thoughts. She looked at Kip she came out dragging a piece of Jerky behind him. He had been sampling the stores and apparently some kind of spirits by his smell. She shook her head. "Kip I can't take you anywhere can I? My apologies, he is house broken but his manners are lacking." Thas peered up at Sharla tilting his head slightly. "Dreams have a way of seeming real. Perhaps something that kept your mind from falling into insanity given all the things that happened to you. Though as I recall we have always been good friends. Or I should say you were good friends with my persona of Locke. Regardless I am as much the same as the persona just a different appearance and name." When Thas noticed the little fae dragon named Kip dragging a piece of jerky he chuckled a bit. "Its quite alright, I did after all say that my guests were welcome to help themselves to the supplies. Certainly nothing comparable to previous guests I have had on board. Such as the time I was entertaining a Elemental Lord in the plane of fire to gain passage through the realm without a incident." The dragon chuckled again shaking his head slightly. "As for where I have been since I left, I left to find others of my kind. To see if there were any. Visiting Tai'mira now and then to make sure things were fine in my own realm between the planes. I suppose you could call it a nexus of sorts. All the planes of existence converge on that one point. A place I shaped to suit my needs at one time. I did find what had happened to my kind. A darkness changed them to what you would recognize as the black dragons. So I am likely the last of my kin left uncorrupted by that terrible force. It is the same one that had nearly destroyed the Tai'miran people twice in a time long past." She took this all in and looked up at the sky taking a bit of the jerky that Kip had brought her and petted him. "I am sorry to hear that, I guess we have that in common we are one of a kind and alone in that regard." She pulled her knees to her chest and chewed thoughtfully on the meat. "My own tale is a lot more complex I will wager if forgotten blocks of it for better or worse. I spent time in the underdark as the pet and consort of a Gay Drow Prince... it was an interesting time.... and then a lord took the one thing I thought could never be used for evil and did just that. He kept me in a dungeon with his other subjects using my healing ability to keep his subjects alive while he tortured them and if I refused..."
She touched the dotted scar on her ankle where the anklet had been, her eyes distant. Thasrissian closed his eyes hearing of Sharla's tale. A deep rumble could be heard from his throat then he snorted a small puff of stasis gas from his nostrils in irritation at how she had been treated. The puff wasn't enough to do very much other then a mild disorientation that quickly passed. "Forgive me, its difficult to listen to such things having happened without doing that. Had I known of this when it was happening you can be sure that drow would have seen the fury of a dragon after I finished freeing you. Not all drow are evil, but the majority of them are indeed quite villainous." The dragon shook his head again calming himself. "At least those days are in the past. A place for such things to remain." Thas said with a slight nod. His eye color had seemed to shift to a fiery color moments ago slowly changing back to a soft blue. "Should you decide to venture into the city later on feel free to take one of the teleportation runestones from the supply store. It will return you here when you decide to venture back. They should be in one of the chests. I recall labeling everything last time I had to reorganize the storeroom." She nodded to him and lay on her belly bask in in the warmth. Certain things she couldn't share they hurt to much. Rheksas and her son were like that. She closed her eyes listening to the wind and the deep thrum of his voice. True some of the drow had been cruel but Reuell had protected her in his own way. As much as he could in a city run by drow women. He had named her his consort his pet. To others in the Underdark she was his concubine his pleasure slave yet this had been an elaborate farce. He preferred the company of men a secret her and his lovers alone knew. It was together they survived. And she found she had grown to love him in her own way. He could be gentle and compassionate when away from the Matrons eyes holding her and brushing her hair calling her his little lap elf. "Do not think to harshly of the Drow, he took care of me when all sense had left me and kept me alive. I think he loved me in his own way." She looked at him and down to the palace. "I shall travel later but my adventures have worn on me what I want now is just rest. Here high above the world away from villains and dangers I feel at peace like if only for a moment I can stop looking over my shoulder and just honestly rest." Thas nodded to her thinking back on his experiences with the drow. "I suppose the drow you came across in your travels were not like those I've dealt with. Difficult to look past some things when a whole people revel in evils I care not to mention. Though when I hear of one who at the least did something unlike the rest, it gives me hope for their kind." The dragon turned his head looking out towards the city below. "Rest here for as long as you want. This ship won't be leaving here anytime soon. And as long as you keep one of those teleportation runestones you can always return here even when I've decided to travel again." Out beyond the barrier around the skyship snow could be seen slowly drifting to the ground. "Won't be long until enough snow piles up on the barrier for it to start heating up on the outside. Then you'll get to see something interesting." Thas said pointing upwards with his tail. She cast him a curious look and rolled onto her back watching the snow swirl outside the barier it was an odd thing to see the snow and yet stay warm and dry. She yawned and reached for the snowflakes. She liked the snow when she had a thick cloak and a fire to warm up by. Her dress was better then the skimpy clothing she had endured in the Underdark. She watched the snow and thought of all her adventures. She watched the snow pile up on the unseen surface. "How do you manage the barrier Its not like anything I recall seeing." She looks back at him wondering if color changes were due to his mood or the like. If he turned black like his kin what then? The dragon chuckled for a moment. "All the symbols across the deck plating form a complex ward which forms the barrier. In essence it is like casting a spell that doesn't loose potency over time. Constantly renewed by the ward the barrier simply retains its cohesion." Thas turned his face back towards Sharla watching the expression on her face. After a few moments he turned back towards the side of the ship watching as water began rolling off the side of the barrier from the snow being melted off the top causing the barrier to become visible. Once that happened a variety of colors began shining onto the deck of the skyship almost like an aurora when in the polar regions of a world. "It took several generations of experimentation in ward crafting for the Tai'miran people to create something like that barrier. It took me several years to improve on it to the point you see now." Thasrissian could sense part of what Sharla was thinking or perhaps worried about. Would he become like the rest of his kin? He knew the answer to that question. Perhaps the last of his kind there was something to him that had protected him from the fate his own kin had fallen to. Was he blessed by some force in opposition to the evil that claimed the rest of his kind? Having been around long enough to have seen things most wouldn't have imagined to exist Thas had learned not to doubt things. "Even here away from the worries of the world around you something still troubles you?" The dragon asked turning towards her again. She curled up on the deck into a tight little ball it was how she had slept for a long time a mater of self protection. "I worry about you cause you have been kind to me, it is nothing hardly worth noting"
She looked up to him memories of happier times fluttering through her mind. She took those memories with her into dreams and peace of rest. Sleeping sound even upon the hard wood deck, sounder then she had in years. She breathed softly still curled up in a tight little ball. In her mind she thought of the happy times with him with others times before her life had grown so complicated and sad. She dreamed of dances and ballgowns of wine on balconies and soft words and softer embraces. Some dreamed some remembered. Thasrissian smiled watching Sharla drift off to sleep. The dragon cared for those he knew but especially for this particular elf. He could see the potential she had, the promise of a chance of redeeming his kin somehow. Those things of course were possibilities that he foresaw, other paths were different some darker then others. He would do what he could to make sure those paths were not walked or at least not walked alone without someone to hold back the worst those paths could give. "More to you then most realize. A destiny full of potential and great good. Darkness lies along the way as it always will with those who could bring evil to an end. But you rest here safe from the trials of the world till you're ready to face them." The dragon shifted somewhat lifting a wing with which he covered Sharla letting her rest without the brilliance of the barrier disturbing her sleep. As for himself he would remain awake watching the patterns of light dance across the ship. Perhaps one of his favorite past times. As he watched the lights his eyes would shift to a silver color a feeling of sanctuary flowing over the skyship. She slept soundly lost to his words she slept a solid 6 hours and by the end of it she was pressed right up against his side under his wing her breath on his scales. The warmth the closeness she craved it for it seemed forever unobtainable. It was hard to tell what came first the groan and the stretch or the growling of her gut. On the road she ate what she could find. Tubers berries and the like the meat was long since gone. She sat up under his wing and blinked at the dark before realizing she was under a tarp or something. She touched the leathery skin and blinked. "Oh sorry, thanks for that." She said not sure what to call it. The hours had passed by as they normally did for Thas. To him it was more like mere minutes then what it was for her. When she woke Thas lifted his wing up and away tucking it back against himself. "Quite alright, you needed the rest after all. Didn't want to see it disturbed by the brilliant aura of lights coming off that barrier. Difficult to sleep with bright lights shining over your face." Thas chuckled for a moment, having noticed the growling of her stomach. "By the sound of rumbling I heard, it seems you need to eat." Thas said looking towards her with a kind smile before nodding over towards a small table that had not been there before when they arrived. There were different things on it. Sweetrolls, various dishes filled with meats and vegetables of different sorts, different types of fruits. Perhaps it seemed almost a dream to the elf yet there were many things to assure her that what she saw around her was indeed real and not a dream caused by a deep sleep or delusion. "I trust you rested well? Perhaps not as comfortable as a bed but the deck plates are certainly warm like one would be." The dragon said moving his head over closer to Sharla, perhaps as something for her to lift herself up by. She blushed as he mentioned her stomach growling and touched her abdomen lightly "It would seem so.." She echoed looking at the table. Her mouth watered vegetables and fruits and breads as she had not enjoyed in a while. "I dreamt sweet enough, I was safe and warm and had not a worry for miles save for the possibility of a sun burn. You were kind enough to see to that" She got up leaning on his snout hoping it didn't bother him to much. She stood and went over to the table taking a sweet roll and some of the fresh fruits and vegetables. She looked at him feeling awkward about eating in-front of him. "Do you wish to join me? Or perhaps just perhaps you would prefer to go fetch you a sheep so you can enjoy roasted mutton?" She smirked slightly. She bit into the roll and looked at him. Thas chuckled a bit lifting a claw up towards the platter of sweetrolls causing a few to suddenly leap over to him. A few symbols of magic hanging in the air momentarily. "I suppose I will have a few things myself though you should have what you want of the rest. You likely need it more then I." He said moving one of the sweetrolls into his mouth swallowing it whole. "As for fetching a sheep there won't be any need for that. Besides while the meat tastes good they are usually more valued for their wool. Wouldn't wish to upset any of the shepherds either." The dragon chuckled again lifting his head up slightly. "Aside from that I prefer to hunt after my meals if I am in the mood for such." Thas gave her a small grin then moved the second sweetroll he had pulled away from the platter into his mouth repeating the same process as with the first. As small as they were compared to Thasrissian there seemed to be little reason for him to chew on them first. She smiled at him and shook her head "Yes it wouldn't do to scare the Sheppard then people start after the 'evil' dragon." The very idea made her snort." She finished her mean and dabbed her face with her napkin "If I go do you want me to bring anything back?" Her funds were low until she reached one of her hidden cashes here and there. A thief had absconded her refilling coin purse that was linked to one of her treasuries no doubt it was empty and the thief living like a king. She pondered something and fetched one of the runes thinking she would like to do something nice for him. She hugged his neck hesitant to go she liked it here it was warm and safe and far from danger. Thas chuckled shaking his head slightly. "No there is nothing I need brought back here. Any supplies I have need of are brought over to the tower during the time I spend here. A standing agreement that was made several years ago. No you venture out and take care of what you need or visit places you wish to. Though you'll likely want a warm coat and cloak if you plan on venturing out for very long." The dragon's tail happened to be pointing over towards where the boarding ramp was located. A warm coat and cloak were both hanging over the railing there. It seemed the barrier that was visible around the rest of the ship disappeared at that spot, though very likely due to the water flowing away from it as it disappeared towards the underside of the hull. "Given the nature of the weather outside I figured you would need those when you decided to venture out into the city." Thasrissian returned the hug that was given him by carefully wrapping a wing around behind her. "If you run into any trouble just say my name. I'll hear it even from here. Even if its just Thas that you say." He then withdrew the wing tucking it back against his side. She took the cloak and smiled at him slipping the run down her cleavage. She nodded "I will try to stay out of trouble. She nodded to him thinking she best go to the palace and tell Cirdain not to expect her and then she wanted to get something for Thas for his kindness. She disembarked the snow falling on her hair and the wind blowing glad of the cloak as she made for the palace. She used the rune to come back after some therapeutic shopping. she had picked up some fresh lamb for him and a deep grey blue silk and matching thread. What it as for heaven only knew but as she crossed the threshold her empathic powers went haywire. Lives cut short. Slaughtered mercilessly. She was overwhelmed by all of it and it being relatively close so that she stumbled onto the deck. In her mind she felt the pain the screams then the highlight a one worse then the last that made her doubled over in pain. Not her pain, no. A woman. She felt as if she was being torn apart from the inside. She cried out as if her insides were being ground into sausage and the blacked out collapsing on the deck. Thasrissian had been down on one of the lower decks of his skyship inspecting the holds and inner hull when Sharla returned. There wasn't anything that could go on that he wouldn't notice on board the ship. When she collapsed the dragon quickly shifted and appeared next to her. On arriving Thas could feel what she was feeling and for a brief moment it staggered him back before he could shield his mind from the empathic echo. Once he shook off the disorienting effect Thas reached down lifting Sharla up into the arms of his elven form. Thas shifted again taking Sharla to the Captain's quarters setting her down on the bed inside there after which the dragon began forming mental wards around the room with which to shield the elven woman from the empathic wave that was affecting her. Once the ward was constructed Thas activated it causing the outside sources of thoughts and mental energy to go silent leaving only his own and hers to be felt from inside the ward shield. He intended to find out what caused the empathic disturbance but first he would see that she recovered before he set about that task. "Rocen origato dout ricin qe duulo di loerchik vur haddross." Thas said in the tongue of dragons letting the power of the ancient tongue dispel the remaining effect the empathic disturbance had on Sharla. While she likely wouldn't understand a word of what had been said, when used properly the ancient tongue of dragons held some power to it. Few other then the dragons themselves even knew of this. But it was their language that had formed the base for many magic spells during the age when magic was being refined into the craft that it became in later years. Over time there were many changes in the language used for the spells making them easier to cast yet those who could speak the ancient tongue knew the effect it had on casting magic. She would eventually awaken with Thas sitting nearby in one of the leather chairs he kept in the quarters watching her. Even in his elven form the dragon's eyes could be seen as they appeared in his true form at least for now. The room was lit by a variety of glowing crystals acting like lamps within the room even so the pupils of Thas's glowing eyes could still just barely be seen. He had a look of concern on his face while he watched and waited for her to wake up. She did wake and bolted upright in the bed touching her abdomen half expecting her entails to be spilled all over the place. She was intact, well physically at least. There was a mark in her mind and heart from the woman's death something she couldn't shake. She rubbed her temples and groaned. Memories stayed with you and were rarely touched by magics. "Gods, that poor soul. No man or beast deserves such a fate." She closed her eyes and silently prayed that the woman's should would find peace after dying in such a brutal way. She became aware of eyes on her and opened her eyes looking into the dim chair in which he was sitting. "Thank you.... I am sorry. I felt that woman's death so keen as my own. I am sorry to have worried you so." She clasped her hands in her lap and looked in the direction of the Palace she felt a pull. She didn't know what was going on but felt that there was something going on there but she had no desire to be around Cirdain and his wife to be again so soon. She had to wonder if Oona had been killed. The woman had seemed nice and she knew Cirdain had certain charms. She could understand why women fell for him. She never would again. Oh she forgave him alright but there was a difference between forgiving and forgetting the wrongs that had happened. If she forgot she opened herself to be hurt again in the same ways. Thasrissian nodded to Sharla noticing her turn towards the direction of the royal palace. Even with the wards she could still feel things through it. Only a powerful empathic could still sense something from inside a ward like the one the dragon had raised over the room. "I'll be moving the Hyperion over to where the attacks were made soon. The skyship may not seem like it right now but the Hyperion is still capable of her intended function as a vessel of war. I've made several changes over the years to the way things are positioned around the ship of course but I believe the presence of the Hyperion will deter any further raids by whomever it was." The gray dragon stood up from the chair shifting the appearance of the clothing he wore with a simple movement of his hands. He appeared to be wearing some sort of military uniform now with a fancy hat of some sort held in his right hand. "It may be best if you remain in these quarters for a while. I've placed a ward up in here to filter most of the mental energy and echoes out. Given how sensitive you seem to be to such things I figured it best given what I noticed when I found you earlier. Of course you are free to choose not to if you wish. If that is the case perhaps you might consider joining me on the bridge. If there are any further attacks made I could use an extra hand to protect Tallendon's people." Thas flipped the hat he held around once then placed it on his head tilting the brim forwards a bit. "If you do choose to join me steel yourself against what you'll enter into. I've no doubt that the things you felt earlier are still echoing around the city." With that said the gray dragon moved over to the door placing his hands on the frame. Several glowing symbols appeared with lines running along them after which Thas opened the door. Beyond the opened door a large room with some sort of table in the middle with a glowing image in the air over it a map of some sort perhaps. There was also a door beyond that table with a plaque with the word "Bridge" over it. She braced herself and stood up. She looked up at him as he left. So handsome even if the hat was a bit much. She shook the thoughts away and slapped her own cheek. "Focus there is something going on." She closed her eyes and in her mind she turned the sensitivity o the empathic sense way down so even if some one was killed it wouldn't be so completely overwhelming. She followed him shortly out onto the bridge she could feel emotions from both sides but thankfully at a dull roar. It took effort to keep the buffer in place. Often she didnt have to think about it but when suuffering of that scale was near she couldnt do anything about it. "How fast can this thing move, I feel time is of the essence." She gripped the rail white knuckled. She could feel the anxiety and the suffering as other life's were snuffed out. She went a little pale but she refused to go down bellow. She wanted to help and she was the lady of light she could help. She was no weakling and she wasn't afraid. She could try resurrecting the people when all was said and done but such an effort would require the stone to boost her powers. The stone it was powerful she didn't doubt that it had absorbed the essence of gods and held all their might. Whomever used the stone wielded considerable power. It was why she was always hesitant to use it. The allure of power was sweet, even addictive. It might one day make her a tyrant. Someone heroes would swarm together to kill. The road to hell after all was paved with the best intentions. Also if she used it and brought it to others attention she risked it being stolen. She would wait and see. Depending on the number dead and the number of reputable healers who could preform a true resurrection.